A successful outfit isn’t complete unless it’s complemented by the perfect accessories. When we think of accessories, it’s typically a matter of shoes, bags, jewelry, and sunglasses. But what about tech? The more that technology advances, the more modern—and fashionable—it becomes. Now, there are plenty of easy ways to up your tech fashion game without sacrificing form, function, or quality. We don’t go anywhere without wearing an Apple Watch or Fitbit, so it should look really, really good… right? While leather bands are a standard-go to for dressing up a wearable device, consider pairing your smartwatch with a metal link band—it makes the gadget feel suddenly dressier and more jewelry-like. Stack it with your favorite bracelets for a layered look, or let it be a statement piece all on its own. Over-the-ear headphones are a very noticeable tech accessory, so why not make them the most stylish thing you’re wearing? The Master & Dynamic MH40 headphones are both attractive and functional, trimmed in luxe leather for a sophisticated, yet vintage-inspired look. And for great-looking earbuds, try the i.am+ BUTTONS wireless headphones. They’re crafted in a super-sleek, futuristic disc shape (think of them as a little bit of candy for your ears). Tech fashion isn’t simply about what you wear; it also relates to how you decorate. For your home or office, check out Ultimate Ears Bluetooth speakers. In addition to outstanding sound quality, the speakers come in distinctly decorative colorways, including watercolor print, concrete, and novelty patches. 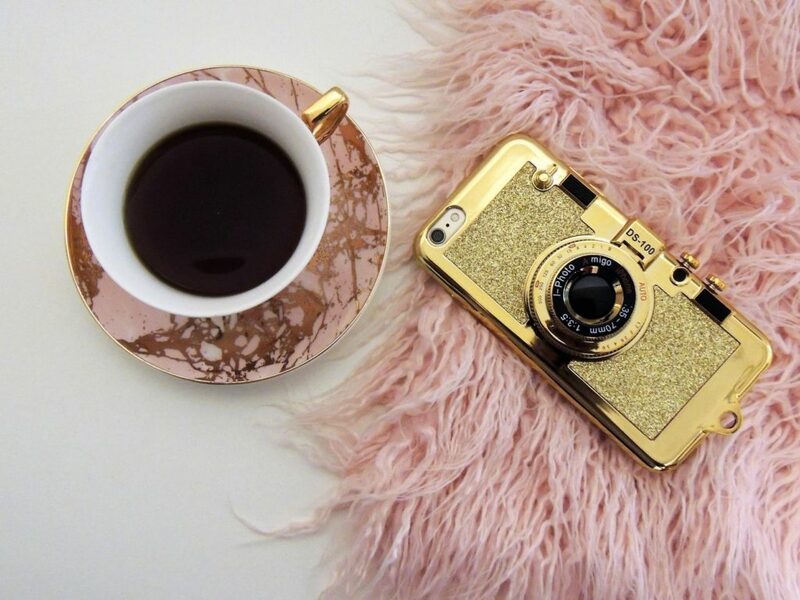 What your phone is wearing can say a lot about who you are, so it’s best for your case to be of good quality and super cute. Aim for striking patterns, shimmering metallic hues, and—of course—you can’t go wrong with glitter. A bonus to having a dressed-up phone case? It makes it so much easier to spot the phone in a lineup, from across the room, or in the bottom of a cluttered bag. So, go ahead, stand out in a crowd. For busy professionals on the go, the right laptop or tablet sleeve is essential for protecting an important tech accessory. So why not use something statement-making? A cork laptop sleeve is simple, beautiful, and completely unexpected (oh, and it’s eco-friendly, too). For tablets, consider leather sleeves for a blend of timeless style and desirable longevity (and make it your own with a monogram). Staying charged on the go is important, but your charger doesn’t have to be an ugly, clunky little gray box. Now, it’s incredibly easy to look chic while boosting your battery level. To make a statement while staying juiced, look for chargers in bold patterns, glossy finishes, or unconventional shapes. And for something ultra-modern, go for a marble look. Say goodbye to boring, ordinary keychains. USB tassels provide a fun, decorative solution to a common technology quandary: too many cords. Clip one onto your purse or luggage to discreetly bring a charging cable everywhere you go. Depending on which tassel you choose, it’s also a great way to add a playful pop of color to a neutral bag. Easy access to your phone is essential, no matter how low the temperatures drop. That’s why touchscreen gloves are style-savvy way to boost your tech fashion sense. Slip on moshi texting gloves to help you stay connected—even during frosty temps. They feature a conductive fiber on every fingertip, allowing you to enjoy full touchscreen functionality, all from the comfort of microfleece lining and a knit exterior. Smart, huh?